If you're interested in using Stripe to process credit card payments inside of Brandboom, you'll need to start by setting up the Invoicing Add-On before proceeding with the steps here. 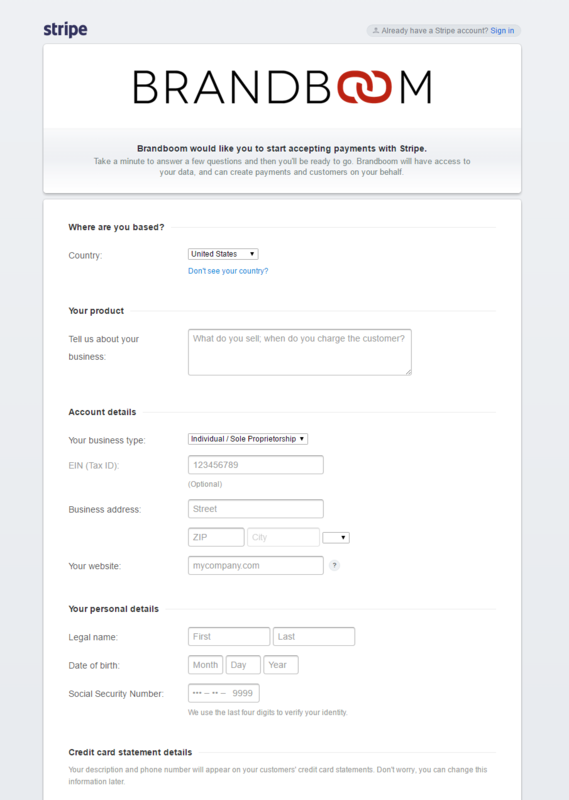 See Set Up Invoicing for more information. When you click on "Setup Stripe," you will be taken to a signup page. If you already have a Stripe account, click Sign in in the upper right corner. 3) Once you are connected to Stripe, the "Setup Stripe" button will be replaced with a Stripe Connect Key value to confirm the connection. 4) Now, on newly generated invoices, you will see a Stripe checkbox and a Stripe option in the Payment Method dropdown list when clicking Add Payment. See Process Credit Card Payment with Stripe for more information.